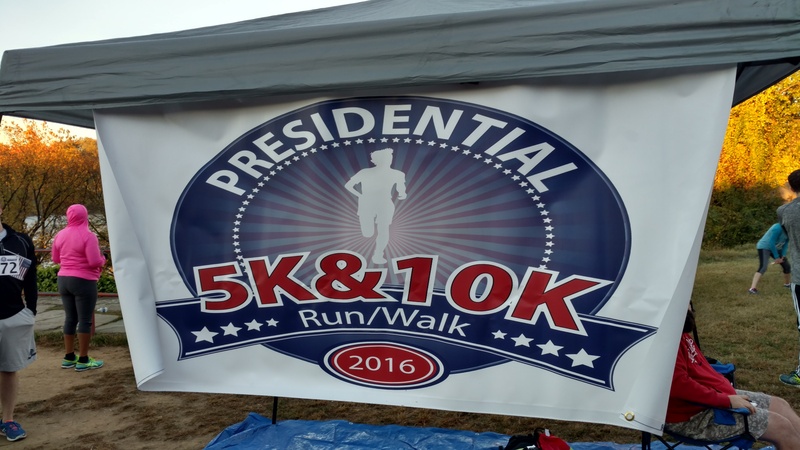 When I planned my 2016 race schedule I was looking for local races in shorter distances. 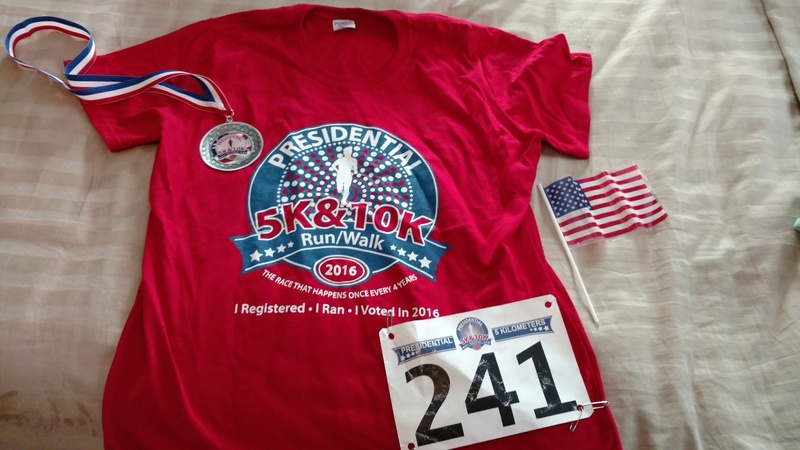 This one jumped off the screen at me when I found it: a race that would be run only every 4 years (Presidential election years) with options for 5K and 10K distances in Washington DC’s Georgetown neighborhood. This race was scheduled for the same weekend as runDisney’s Wine and Dine race weekend, which I knew I would not be running in 2016, so doing this race would give me something to do while so many of my friends would be in Florida posting pictures to social media to make me jealous of what I was missing (ahem, Mike and Candace, I’m look at you!). So I signed my husband and I up back in February 2016, put it on my calendar, and promptly forgot about it for about 6 months. After running the Bozeman half marathon in mid-September, I had done almost no running. I was on a road trip until the end of September (during which we took a lot of walks but no running) and then in early October I somehow threw out my back and had residual sciatica pain for the rest of the month that got worse whenever I tried to run. Thankfully I’d signed up for the 5K rather than the 10K, and I knew I could walk that distance within the time limit. 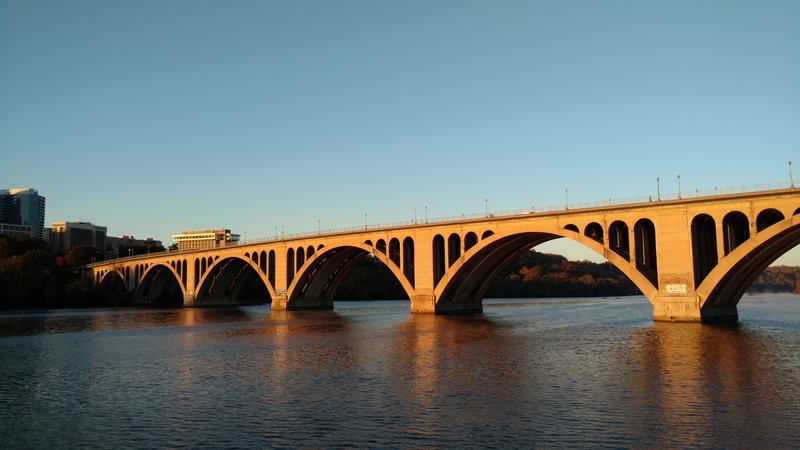 Packet pick-up occurred the morning of the race under a bridge at the end of the road under the Whitehurst Freeway in Georgetown. Parking for the 5K runners (the first race) was very easy as there were plenty of spots under the freeway near the trailhead. Parking wasn’t free (at least, I wasn’t willing to take a chance and get a ticket…though I did see that a few people didn’t pay at the meter) but it wasn’t that expensive. Parking may have been a bit harder for the 10K runners who arrived an hour after the 5K runners did. We arrived about an hour before the race started and picked up our bibs from the table. All we got were our bibs and a small American flag, the shirts and SMO would come after the race. Since it was a bit chilly that morning after stopping at the port-a-potties we walked back to my car to warm up, adjust our gear, and attach our bibs and flags. Swag was pretty minimal for this race: a small American flag (the whole point of the race was to encourage people to vote) and a short-sleeve cotton shirt. Nothing fancy, but not the worst swag I’ve ever gotten. I mean, it IS more than you get for a runDisney 5K. You can check out my picture of the swag and SMO down below. I had kind of forgotten about this race until just a few days before (it’s what happens when you do most of your race scheduling early in the year). So I didn’t take the time to plan a good outfit. 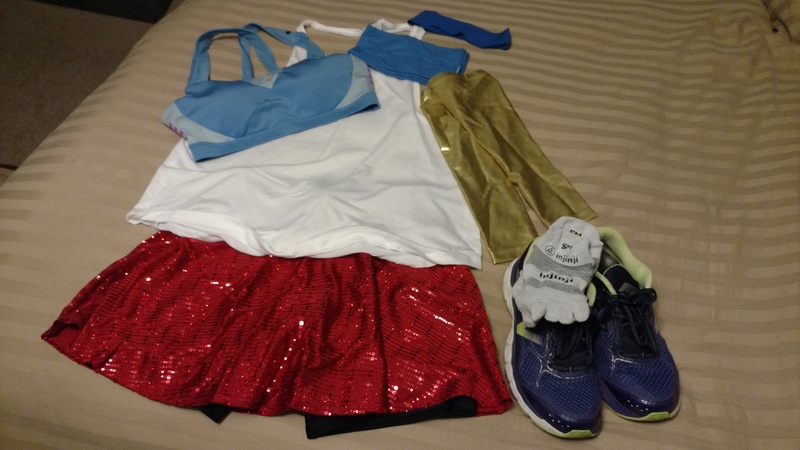 I pulled together a red, white, and blue theme from my normal running clothes: red sequined Sparkle Skirt, white Nike tank top, blue Adidas sports bra, gold Sparkle Athletic arm sleeves, light blue buff that I used for a headband and ear warmer, Injinji socks, New Balance 860v6 shoes with custom orthotics, Garmin Forerunner 620, and Nathan handheld water bottle. After warming up for several minutes we decided to take a little walk along the waterfront to stretch our muscles. It was a beautiful morning and we wanted to take a few pictures along the water. 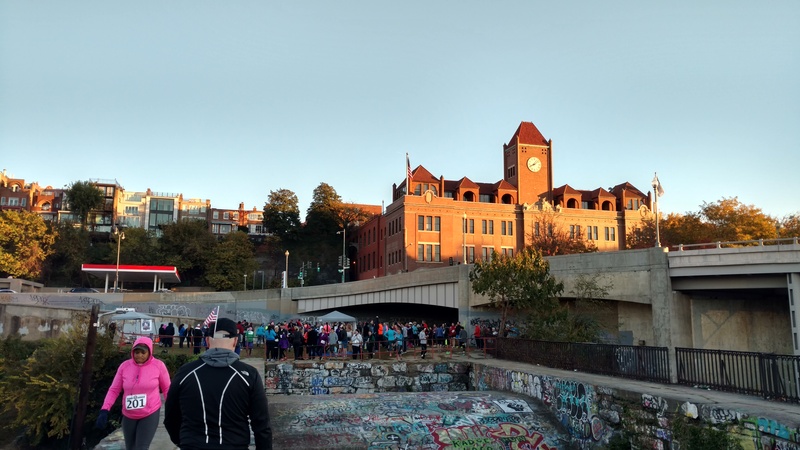 Then we decided to head over to the start of the race to try to get a better vantage point for pictures of Georgetown University. Unfortunately, we learned that someone had a very bad pre-race experience. As we were waiting we heard the DJ call for assistance from a medical professional. Apparently someone had a seizure near the packet pick-up table. I saw at least one person who claimed to have medical training head down to the table and I never heard sirens or other emergency vehicles come toward us, so I assume the emergency was handled and that the person was OK. At least, I hope they were OK. This was a small race (fewer than 400 runners for the 5K and capped at 500 runners for the 10K) and the trail was not closed to the public. There were no water stops during the 5K, though I assume there must have been one further down for the 10K runners. 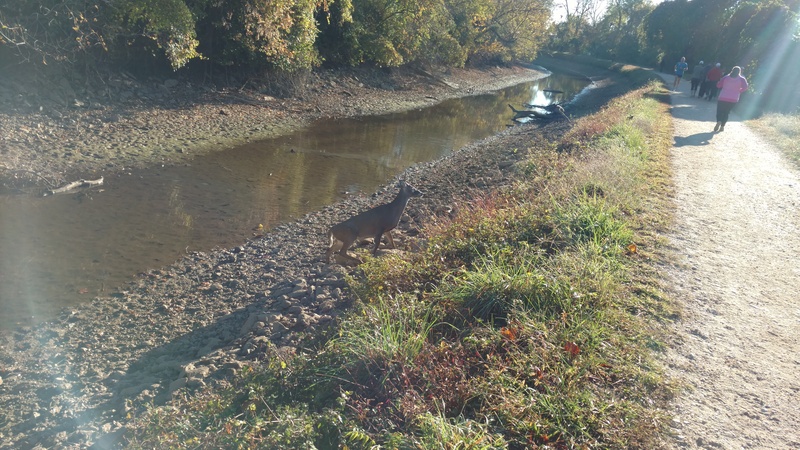 The scenery was kind of pretty:mostly trees and some views of the water but my favorite part was when a deer crossed the path and ran down toward the river! As walkers we were some of the last people to finish. Although the 10K runners were lined up and ready to start their race as we were coming in, it seemed like the organizers decided to wait to start the 10K until the last of the 5K runners crossed the finish. It was kind of nice to have a built-in cheering section at the finish but I could imagine it being quite embarrassing for someone who isn’t used to having people witness their back-of-the-pack finish. Although it was nice to get a SMO for a 5K (which is quite unusual in this area), I was surprised at the relatively low quality of the medal. It kind of resembled a little plate with a decal of the race logo on it, and it was hung on a standard red, white, and blue ribbon. Still, I wore it for the rest of the day to run errands and attend the expo for the Across the Bay 10K (which I would run the following day). After we crossed the finish line we got in line to get our SMOs and t-shirt. I was not impressed with this process at all, and it is something the organizers can spend the next 4 years improving. We found a line that was probably 40 people long and wound back and forth to get to a table with shirts and SMOs. We waited in this line for probably 10-15 minutes before my husband saw a guy kind of behind the table who had no line and was giving out SMOs and shirts. So Jake went over and got his and then waved me over to get mine…which ended up being a huge mistake because the guy kind of sneered at me and haughtily told me that was the men’s line. So…back to the ridiculously long line for another 15-20 minutes to get my shirt and SMO. I still don’t understand why it took so long but this process could have been fixed by: 1) having signs to designate two lines for men and women, 2) giving out the shirts at packet pick-up, and 3) not taking 5 freaking minutes per person to hand over a simple shirt and SMO. 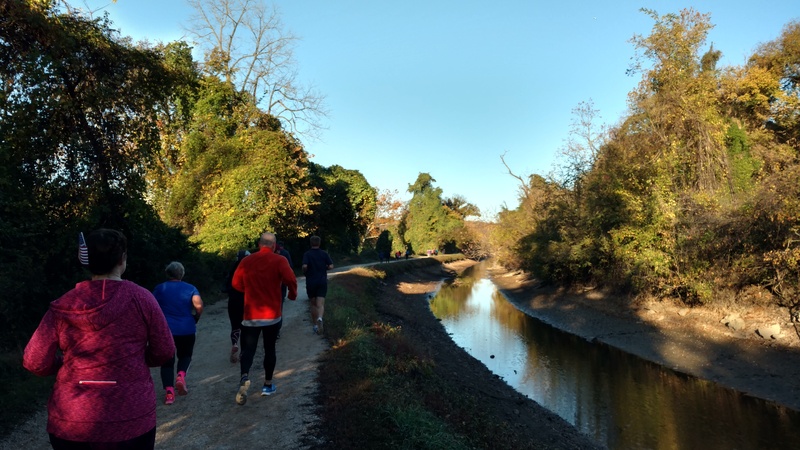 The race organizers held an after-party after the 10K finished at a restaurant in Georgetown, but we had errands to run so we left directly from the race to get some breakfast at a cute farm-to-table place in Old Town Alexandria (Virginia). 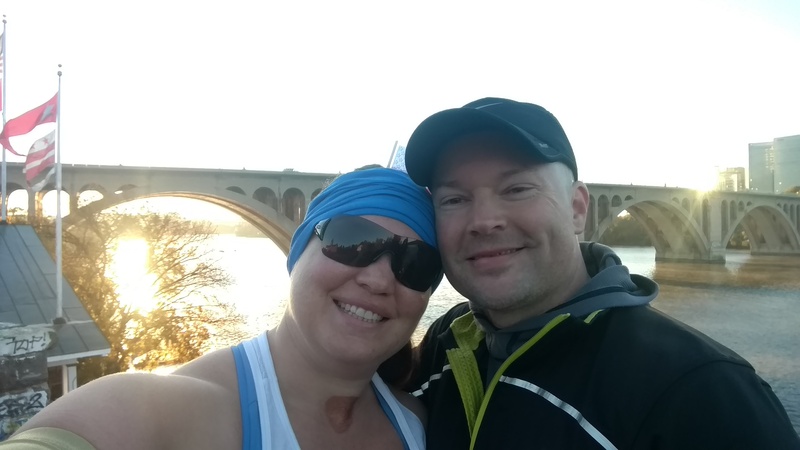 I walked this race with my husband, so no music for me this time. This was a fun little local race. It’s not something I would recommend as a destination race but it was a fun event with the community. There were a lot of students and professors from Georgetown, as well as other local residents and a group of Naval Academy athletes who bussed in. There were some really serious runners, but also families with small kids. Overall it was a good event. However, there are definitely things that can be improved, including the fiasco at the end getting shirts and SMOs. But it’s fun to say that I ran in such an exclusive race and I’m optimistic that the organizers can make the needed improvements over the next 4 years. Can’t get enough of touring Washington, D.C.? Check out our videos taking you on a tour of the Monuments & Memorials and visiting the Giant Pandas and other residents of the National Zoo!